Over the last week or so, many of our clients and friends have been caught out by a change to the Windows 10 upgrade notifications that have been appearing on their computers. While previously it was ‘OK’ to not make a decision about upgrading to Windows 10 or choosing a scheduled upgrade by clicking on the red cross at the top right of the window, this now does something new… Now by closing the window (dialog box) with the red cross, this automatically schedules the update to Windows 10 to begin in a few days time. Unless you noticed this, you can be caught unaware and the upgrade can start without you really knowing it was going to begin! 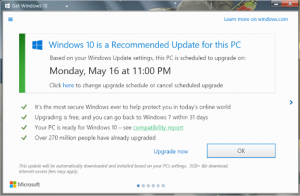 Now if you find yourself in the position of scheduling the upgrade in error or you just can’t stand the constant barrage of popup messages tempting you to upgrade, then the next couple of options will be useful to you. First, click the Get Windows 10 app icon in your taskbar (bottom right), which will then launch in a new window. Now, click the hamburger icon (the three horizontal lines) and select ‘View confirmation’ from the menu. Then click ‘Cancel reservation’, at which point you’ll be asked if you’re sure. Since you are, go ahead and select ‘Cancel reservation’ again. In the search box now just above the start button type ‘cmd’. When the search results return above, find the programme ‘cmd.exe’ with a black(ish) square icon. Right Click the ‘cmd.exe’ link and choose ‘Run as administrator’ (a popup will appear asking you to confirm the User Access Control), click ‘Yes’. Then in the black box type the following command: wusa /uninstall /kb:3035583 (focal the onscreen prompts that will ask for confirmation to uninstall update – will take a few mins to popup). Once this completes, type ‘exit’ on the black text command prompt window to close it. Please bear in mind, there is always the possibility that Microsoft will reinstall the update by the regular Windows Update service but Magikos IT will endeavour to keep this article up to date to reflect any changes that might be implemented. If you have found this article useful then please consider connecting to us on social media (see the ‘Home’ page footer for details) or if you need any further advice and guidance then please click the button below or follow the link to the ‘Contact’ page.